It is with great sadness that we say goodbye to our dear friend and family member, Justin Leigh Ingram. He passed from this world on Friday, January 12, 2018 in Tulsa, OK. He was only 35 years old. 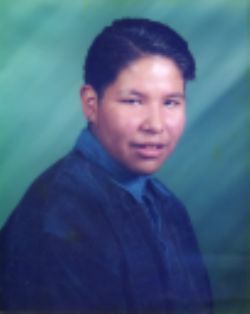 He was born in Ponca City on January 24, 1982 to Ronald Joe Ingram and Pamela Sue Lieb Ingram. Pamela Sue was the daughter of Henry Lieb and Beulah Evelyn Cries for Ribs Lieb. Justin worked as a game tech in the gaming industry for many years. He enjoyed playing baseball and watching sports. His favortie team was the Colorado Rockies. His favorite color was purple. Justin had a poet’s soul. He loved to write poetry although he didn’t like for anyone to read them. He loved turtles and Kurt Cobain. Justin loved to sing, he sang all the time. Most people say they remember him singing when they met for the first time. He enjoyed listening to Prince and all of the ”Great Oldies”. He is survived by a son, Darrell Delodge, two sisters, Cherisse Annette Ingram of Okmulgee and Beulah Rose Ingram, grandmother Bernice Wrolstad and grandfather Henry Lieb, several nieces and nephews as well as many aunts, uncles and cousins. He was preceded in death by his parents, a sister Daniella Ingram, and a grandmother Beula Evelyn Ingram. A traditional tribal burial service will be held on Tuesday, January 23, 2018 at the Ponca Indian Methodist Church in White Eagle. The minister Jimmy White will officiate. Burial will follow the service at the Ponca Indian Cemetery in Ponca City, OK. Casket bearers for the service include Joseph Ruff, Henry Ruff, Ames Warrior, Chandano Cornell, Sky Lieb, and Theumba Lieb. Honorary bearers include Jeffrey Lieb, Jr., JD Ruff, and Josh Day. ”I’d rather be hated for who I am, than loved for who I am not”-Kurt Cobain.